It is 5 o’clock in the morning and only a hint of sunlight is visible on the horizon. Besides the sound of a light breeze swirling through the grass, all is quiet on the Nebraska prairie. Everything seems to be asleep. Then, suddenly, “whhooo-doo-doooohh” breaks the silence. The prairie-chickens have arrived. The Greater Prairie-Chicken is a medium-sized grouse that lives on the prairies of central North America (Figure 1a) (Schroeder and Robb 1993). Prairie-chickens are well-known for their breeding activities in which the males congregate in groups each spring and perform elaborate courtship displays to attract females (Figure 1b). The areas where the males gather, called “leks,” are distributed across the landscape. 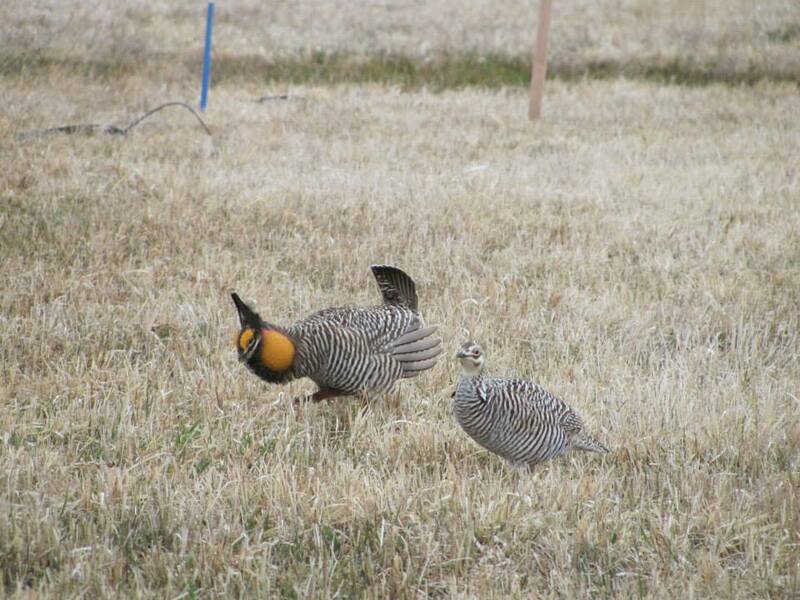 Female prairie-chickens visit leks every morning to observe and compare males until a suitable one is chosen. After mating, females leave the leks to nest and raise their broods on their own, while the males remain on the leks and continue to perform courtship displays. Click the link to watch a video clip of prairie chickens lekking. 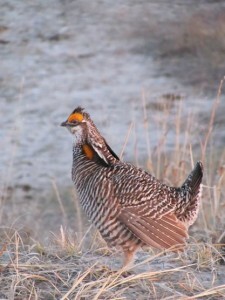 Figure 1a: A male Greater Prairie-Chicken. 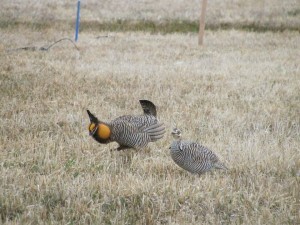 Figure 1b: A male prairie-chicken performs a courtship display for a female. These complex courtship behaviors do not occur in silence. 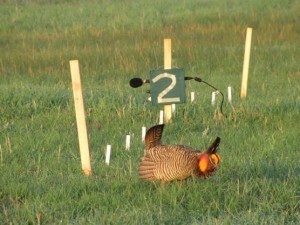 Vocalization plays an important role in the mate choice behavior of prairie-chickens. As part of a larger study addressing the effects of electricity producing wind turbine farms on prairie-chicken ecology, we wanted to learn more about the acoustic properties of prairie-chicken calls. 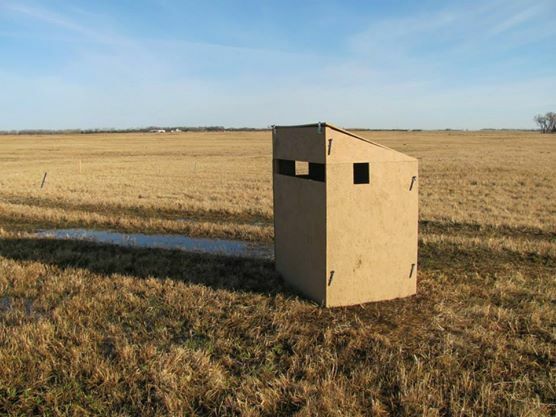 We did this by recording the sound of prairie-chicken vocalizations at leks in the Nebraska Sandhills. We visited the leks in the very early morning and set up audio recorders, which were placed close enough to prairie-chickens on their leks to obtain high quality recordings (Figure 2a). Sitting in a blind at the edges of leks (Figure 2b), we observed prairie-chickens while they were lekking and collected the audio recordings. 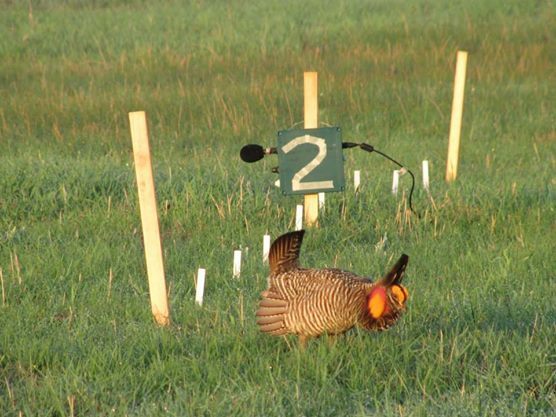 Figure 2a: We used audio recorders to record male prairie-chicken vocalizations at the leks. Figure 2b: We observed lekking prairie-chickens and recorded vocalizations by sitting in a blind at the edge of a lek. Male Greater Prairie-Chickens use four prominent vocalizations while on the leks: the “boom,” “cackle,” “whine” and “whoop.” The four vocalizations are distinct and serve different purposes. or to watch a boom video clip we recorded at the leks. The “cackles” are short calls typically given in rapid succession. Prairie-chickens use the cackle as an aggressive or territorial call (Sparling 1981, 1983) or as a warning to alert other prairie-chickens of potential danger, such as an approaching prairie falcon, coyote or other predator. Click to listen to a cackle sound clip. or to watch a video clip of cackles and whines (the cackles are the shorter notes and the whines are the longer notes). or to watch a whoop video clip. We measured acoustic characteristics of the vocalizations captured on the recordings so we could evaluate their features in detail. We are using this information about the vocalizations in a study of the effects of wind turbine sound on Greater Prairie-Chickens (Figure 3). We hope to determine whether the vocalizations produced by prairie-chickens near a wind farm are different in any way from those produced by prairie-chickens farther away. For example, do the prairie chickens near wind turbines call at a higher pitch in response to wind turbine sound? Also, do the prairie chickens near wind turbines vocalize louder? Ultimately we would like to know if components of the prairie-chickens’ vocalizations are masked by the sounds of the wind turbines. 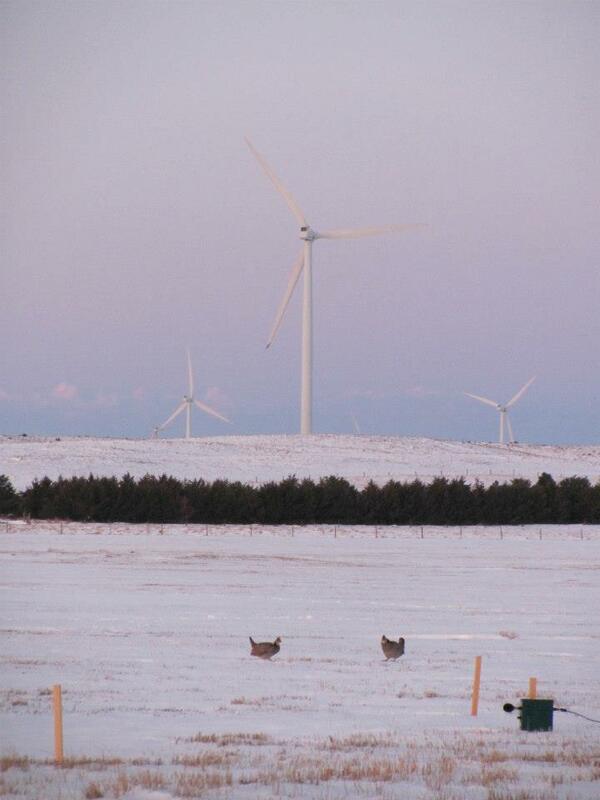 Figure 3: We are conducting a study of the effects of wind turbine noise on Greater Prairie-Chickens. The effect of anthropogenic noise is an issue not limited to Greater Prairie-Chickens and wind turbines. As humans create increasingly noisy landscapes through residential and industrial development, vehicle traffic, air traffic and urban sprawl, the threats posed to birds and other wildlife are likely to be significant. It is important to be aware of the potential effects of anthropogenic sound and find ways to mitigate those effects as landscapes become noisier. Schroeder, M. A., and L. A. Robb. 1993. Greater Prairie-Chicken (Tympanuchus cupido). In The Birds of North America, no. 36 (A. Poole, P. Stettenheim, and F. Gill, Eds.). Academy of Natural Sciences, Philadelphia, and American Ornithologists’ Union, Washington, D.C.
Sparling, D. W. 1981. Communication in prairie grouse. I. Information content and intraspecific functions of principal vocalizations. Behavioral and Neural Biology 32:463-486. Sparling, D. W. 1983. Quantitative analysis of prairie grouse vocalizations. Condor 85:30-42.